Couples planning on starting a family in our modern age of genetic technology have options that no previous generation of prospective parents have had before: the opportunity to have their genetic information tested in order to predict what traits their children will inherit. The companies that provide this service specialize in “ direct to consumer genetics”. Unlike genetic testing used in a medical setting, these tests are not ordered by physicians, but rather purchased by consumers seeking to gain information about their own genome. One such firm is 23andMe, based in Mountain View, California. On their website, 23andMe advertises testing for over 256 genetically inherited diseases and conditions. This type of testing offers a way for individuals to know whether they are at future risk for a disease, such as diabetes or arthritis. Customers can then consider – before they conceive a child- how they feel about potentially passing on the condition. However, understanding the information returned by the company can be difficult. Typically results are presented as a percentage increased risk over the general population, such as: “Based on your genotype, you have 1.19 times higher odds of developing kidney stones”. It is then up to the consumer to decide if the increased risk warrants lifestyle changes or medical intervention. Screening for diseases is only one application of the technology used by 23andMe. The company has also developed an algorithm that can be used to make predictions about a future child’s traits based on the parents’ DNA (both parents need to be 23andMe customers). This is presented as the “Family Traits Inheritance Calculator”, and it has been available to couples since 2009. It offers screening of genomes for inherited traits such as height and eye color. 23andMe claims that the Family Traits Inheritance calculator offers an “engaging way for you and your partner to see what types of traits your child might inherit.” The calculator is presented as a tool, a more scientific way of predicting a baby’s appearance than looking at family members and guessing what the child might inherit. In 2008, 23andMe filed for a US patent on their methods for statistical analysis of inheritance, and last week they announced that the patent was awarded. Surprisingly, the focus of the patent as it was written five years ago was for the use of their statistical tests in choosing gamete donors. The patent outlines a process for the application of 23andMe’s technology in fertility clinics. According to the patent, prospective parents may select a “phenotype of interest” for their child. (A phenotype is the physical manifestation of a gene, (i.e. tall, brown hair).) Then, a donor may be selected according to the probability of the child expressing the “phenotype of interest” when the donor’s gametes are matched with one of the parent’s. 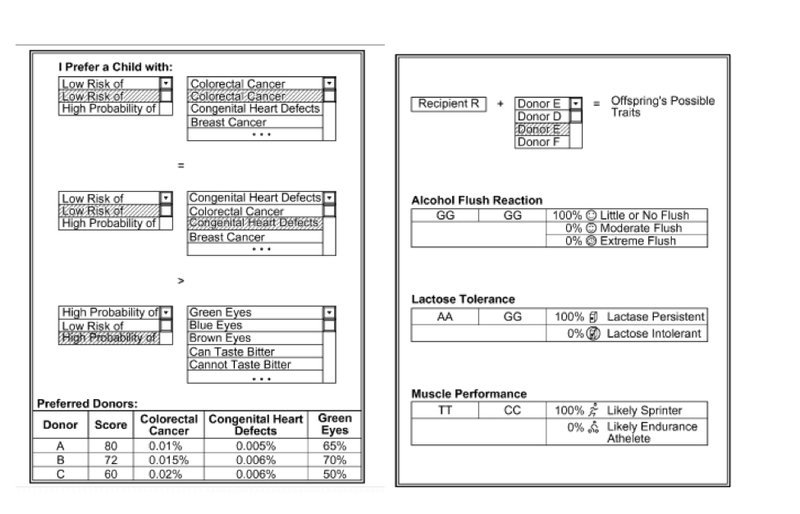 The examples given in the patent show a list of phenotypes from which prospective parents may select; the choices include eye color, allergies, muscle composition, and even life span. Still, now that the technology is theirs exclusively, we have to imagine that the temptation to be the pioneers of this type of applied genetics and the financial incentive to venture into the fertility clinic market will be enticing. Are “designer babies” close to becoming a reality? Will parents embrace the opportunity to select traits, such as eye color, in their kids? Callaway, Ellen. “Personal Genetics Firm Denies Pursuit of ‘Designer Babies.’” Scientific American 2 Oct. 2013: n. pag. Web. 5 Oct. 2013. <http://www.scientificamerican.com/ article.cfm?id=personal-genetics-firm-denies-pursuit- of-designer-babies&WT.mc_id= SA_DD_20131003>. “Test for 40+ Inherited Conditions.” 23 and Me. N.p., n.d. Web. 5 Oct. 2013. <https://www.23andme.com/prospective-parents/inherited-conditions/>. Wojcicki, et. al. “Gamete Donor Selection Based on Genetic Caluclations.” FPO IP Research and Communities. N.p. : n.p., n.d. United States Patent US8543339. Web. 5 Oct. 2013. <http://www.freepatentsonline.com/8543339.pdf>.